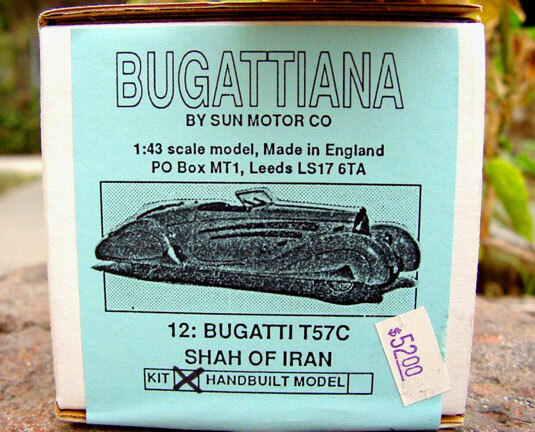 Note on ebay: Resin model (1/43) kit of famous Buggati T57C, originally owned by Mohammad Rezad Shah Pahlavi by Sun Motor Co.(#12). Great-looking resin casted body (just like Provence Moulage quality), chrome-plated white metal pieces and also turned metal wheel and head light rims, and also plated photo-etched parts on the sheet. (Super high quality look) . The rendition of the body shape is very nice. It's rather emotional than mechanical! The kit comes with instruction sheets and historical description of the actual car with decent example pictures. Kit style is rather different from other make but easy to follow. The detail level are similar to those of Vroom and Provence Moulage.